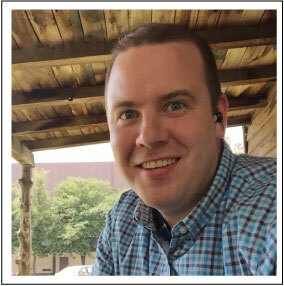 Adam is the newest addition to our design team, here at JPT. Unlike some of us around the office, he’s very quiet and pretty much keeps to himself, but he’s also the guy on our team we didn’t know we always needed! Adam also has a very lovely family who, lucky for us, like to visit the office. Having had the opportunity to get to know his wonderful family (especially those two adorable little boys!) the calm nature he possesses somehow makes perfect sense! That said, let’s all get to know a little bit more about JPT’s man of mystery. 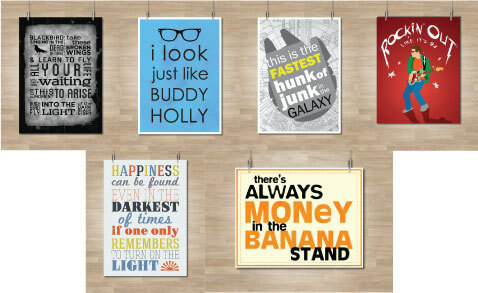 My wife and I opened an online design business called “It’s Personal Prints” on July 4, 2010. We sold party invitations, decorations, posters and custom items. It has since been re-branded as “Celebrative Design”. I began my full-time, professional career in September 2011 as a graphic designer for Rainbow Sign & Banner in St. George, Utah. What drew you to becoming a designer? While I was doing my advertising courses in college, I saw myself more as a copywriter. When I took Intro to Visual Design, all of that changed. I found I had a knack for design and aesthetics, and found myself a quick learner when it came to design software. I quickly found a passion for logo design as well. Old rock ‘n’ roll concert posters, record covers, band logos and guitars have been a major source of inspiration for me. Shepherd Fairey, Saul Bass and Storm Thorgerson are some of my favorite designers. If I weren’t a designer I would love to be a writer. What’s your favorite font to use when you are designing? My favorite font, though I try to use it a little less these days is Gotham. The clean lines, the classic-yet-modern letter shapes, and the versatility make it an obvious go-to that I have gone to time and time again. It can be used as body copy or for a logo. When you’re not at work, what do your hobbies include? Playing guitar, harmonica and ukulele, spending quality time with my boys (Jack and Ian), and being an Assistant Scout Master for a local scout troop. What part of designing do you wish you could focus your day around? I would like to design graphic wraps for guitars and other musical instruments. 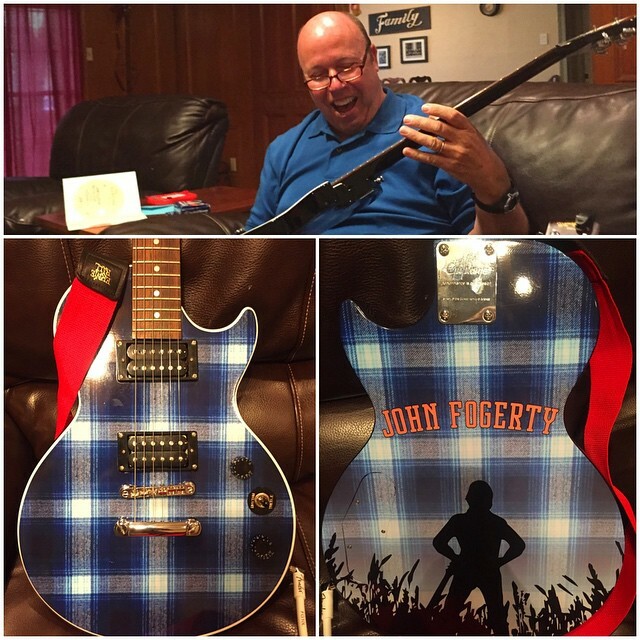 For my dad’s Father’s Day gift last year, I designed a wrap to replicate his favorite musician’s plaid Les Paul. It was a hit. I have always loved reading, but don’t make as much time for it as I once did. Right now, however, I am in the middle of a really well written Tom Petty biography. Up next is Go Set A Watchman, the second novel by To Kill A Mockingbird author, Harper Lee. Other artwork created by Adam! This entry was posted in Design, Get to Know JPT and tagged JPT, JPT Designers, jpt team. Bookmark the permalink. Another cool thing is he rides a scooter to work when it’s nice outside. He seems like a really really… really cool guy.